God yes but religion no? During the QAU assessment, construction workers are installing steel bars for the widening of Sapinit Viaduct. 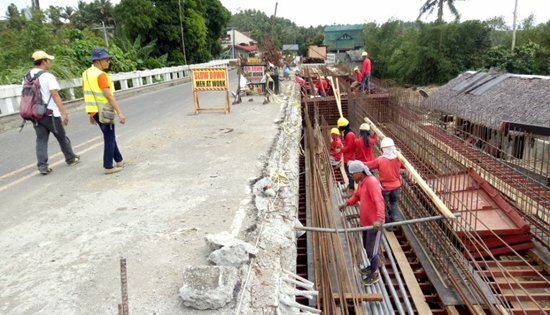 CALBAYOG CITY – DPWH Samar First District Engineering Office (SFDEO) has programmed five (5) bridges for upgrading this year. A total of P415 million projects which involves retrofitting and strengthening, and widening to more than two (2) lanes is soon to be implemented under GAA CY 2017. Bridges scheduled for upgrading include: Oquendo Bridge (B00370SM) along Calbayog-Catarman Rd., P20 Million, for widening to more than two lanes; Sapinit Viaduct (B00337SM) along Daang Maharlika, Phase II - P40 Million; Binaliw Bridge (B00337SM) along Daang Maharlika - P155 Million; Jibatang Bridge (B00342SM) along Daang Mahalika - P130 Million; and Rosales Bridge (B00345SM) along Daang Maharlika - P70 Million. The detailed engineering works for four (4) projects are almost completed while the widening of Sapinit Viaduct Phase II has started already. The upgrading implemented is in keeping with the demand of a widened road, therefore, a widened bridge to lessen accidents and provide safe road.